Full of sherry, oranges, grassy and fragrant. Gradually follow mirabelle plums, pears and spicy aromas of cinnamon, cloves and vanilla. Over time, hay, cereal dust, fabric panels and Jutetaschen filled with dried fruit. Soft and full in the body. First, delicate fruitiness, which slowly goes to hay, malt and cereal notes. The whole thing is framed by delicious Fino notes, pepper and other spices. Long, dry, apple chips, malt, herbal hay and oatmeal cookies. 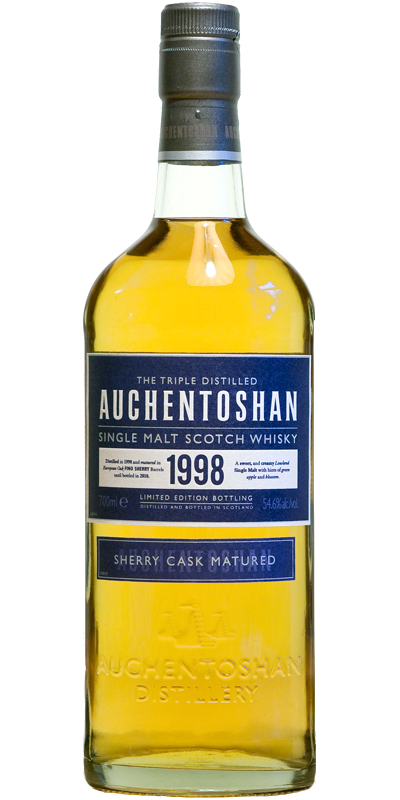 Auchentoshan 1998/2010 (54.6%, OB, sherry cask matured) Colour: pale white wine. Nose: the colour was surprisingly pale for a whisky that’s supposed to have spent all its life in some sherry wood, but the nose does suggest sherry indeed. Bubblegum, strawberries and litchis are all over the place, then more oranges, marmalade, cinnamon and peppermint. The whole is very, very clean and fresh and quite beautiful I must say. With water: the sherry is more obvious and it’s rather a leafy/leathery kind of sherry influence. Beautiful nose I must say. Mouth (neat): rich and extremely sweet and fruity, it’s really ‘bubblegum at cask strength’. Also blood oranges, muesli and then candied ginger and a little pepper. With water: even fresher and fruitier. A fruit salad with a little cinnamon. Finish: quite long, fresh, with the spices coming more to the front. White pepper. Comments: very good in my opinion, even surprisingly good considering its age, and highly drinkable. SGP:751 - 86 points. The sherry sounds and the oak comes and stays for a long time. Nose: Sherry or not , this one is fragrant with quite some orange peel, cereals and woody sawdust. Vanilla and honey. Fresh is the word. Palate: much sweeter than the nose. Creamy Sweet dough, dry wine , big fino and butterscotch. Dried fruits enter the party, but not heavy dried fruits. On the second wave a bit of zest is back. Finish: dried fruit. Dough , wood and cocoa. Interesting. Lovely mouth feel and thick without being too heavy on the sherry. Not ultra complex, but enjoyable and mouth coating, with a good strength and body at this high %ABV. A very nice, after dinner dram. Still available in some online stores (TWE for example at ~ £40). At that price you can get better drams, but considering it’s bottled at 54,6%,it’s a fairly good deal in my opinion. 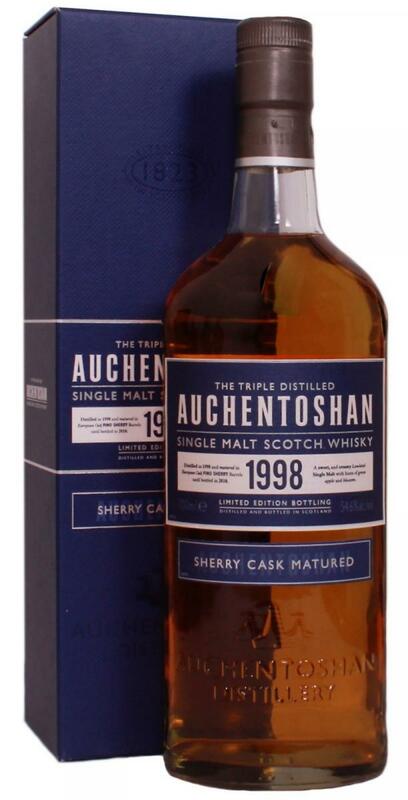 The sherry is not very outspoken in this one, but the Auchentoshan character definitely is. Grain, caramel, fig, grape and plum. With water orange and grass. Grain, citrus, yellow raisin, grass, flowers and caramel. Grain, yellow raisin, sushi and a light nuttiness. This whisky is very very light, almost pale. The nose finds light sherry notes, a meadow and fruits, maybe plums? Already in the aroma is a slight bitter touch. The first impression in the mouth: spicy! After a few moments, the tongue discovers dry fruits and sherry. There is a slightly musty note about everything. With water the Auchentoshan opens and brings spice notes such as nutmeg into play. The finish is very heavy and short without water. With water the reverberation becomes much more pleasant. The Auchentoshan not only tolerates water, he demands it. Without water, neither mouth nor nose have a real chance to perceive the individual aspects. With only a few drops of water, the whisky changes, it is milder and lets the various shares come into play. This whisky is only recommended if you like a high alcohol content and if you take the time to play with water. barrels prior to bottling and release in late 2010."